​As the University of New Hampshire’s academic year drew to a close in June of 2015, so too did the long, notable academic career of David Seiler, the University’s longtime Director of Jazz Studies. Dave spent 52 years teaching music at the college level, 43 of them at UNH. Over the course of all those years, he inspired a love of jazz in hundreds of students, sending them on to make their own careers in the music they learned to love. A native of LaCrosse, Wisconsin, Dave received his Bachelor’s Degree in Music Education and a Master’s Degree in clarinet performance from the University of Wisconsin, Madison. He taught at Millikin University, Lamar State College, and the University of Idaho, all before coming to UNH, where, in addition to his duties as Director of Jazz Studies, he was a Professor of Clarinet. 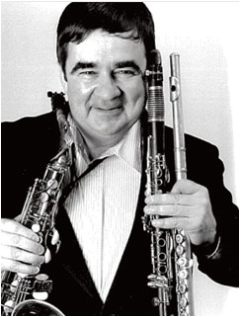 Dave is a founding member of both the University of Idaho and the University of New Hampshire Faculty Woodwind Quintets and has had an extensive career as a guest soloist at high schools, universities, and at jazz clubs and in concerts in the Boston area. Until his retirement from UNH, he was well known as the moving force behind the Monday night Traditional Jazz Series there, and now, in a busy retirement, he continues to organize the annual Tommy Gallant Jazz Festival in Portsmouth’s Prescott Park and to lead the Seacoast Big Band. Seiler’s conducting credits include Director of Bands at the University of Idaho (1963, 1966-72), Director of the University of New Hampshire Symphony Orchestra, and Director of the UNH Summer Chamber Orchestra (a professional group, 1976-84). The UNH Jazz Band, under the direction of Seiler, has performed on the SS Norway Jazz Cruise, the International Association of Jazz Educators, five European tours, and performances with numerous guest artists. Two CDs produced by the UNH Jazz Band, Monk and Then Some, the culmination of a two-year project with Clark Terry, and Dedicated to You, received very positive reviews. His collaborations with Clark Terry have included performances of Duke Ellington’s Nutcracker Suite, Tone Parallel to Harlem, and The Sacred Concerts. Seiler is co-founder, along with colleague Robert Spevacek, of the University of Idaho-Lionel Hampton Jazz Festival and has served as co-coordinator of the UNH Traditional Jazz Series and the UNH-Clark Terry Jazz Festival which he founded in 1974. Seiler was coordinator of the UNH Summer Youth Music School for twelve years and is still active in the program.